The Corgi Witness Protection Program. Did you know there is a Corgi Witness Protection Program? Do you have room for a dog with a history? It’s the one year anniversary of the day that Walter came here from Wyoming to rescue the Dude Rancher and I from the peace and quiet of the Colorado Prairie. He’d done a few things he wasn’t proud of and wanted a fresh start in Colorado. The Corgi Witness protection Program was his ticket to a normal life, meaning a wiggle party with lots of yodeling and frapping with the ducks. Walter got his lure coursing title (read here), and shared his feelings about the whole Predator/Prey thing (read here.) He’s had a good year. Our biggest feat of training was Walter sitting on my lap. No, it isn’t that easy if you spent most of your time before in a crate. He’d get on my lap but then the joy, the bliss, the total euphoria was so overwhelming that he’d almost spontaneously combust. Eyeglasses got smeared, earrings flew, and shirts got torn. His love was all elbows, toenails, and spit; his love was dangerous. Now he can rest against me and last week, he fell asleep on my lap. He’s home and the barking can rest. I was thinking of how we would celebrate this year of living loudly with Walter when I got the email. Warning: Rescue people never forget you. The Wyoming rescue emailed me about a Corgi in Texas. Want to know their secret weapon? They flattered me. They said he was my kind of (too much barking) dog. Like any dog still breathing isn’t my kind of dog. I know tidbits about his past: He and another stray came into a pound together. Herding dogs are famously bad in pounds, not that any breed is good. The Texas rescue stepped in to help. The corgi got his name during the car ride back to the rescue. It seems the good person driving him thought perhaps he liked the sound of his own voice just a bit too much. She named him Preacher Man. Uh-huh. After the usual vet visit, complete with a check-up, shots, and the hormonal nip and tuck, Preacher was ready for a new home. He was adopted with full disclosure to a ‘trainer’ looking for an agility prospect. And returned a few weeks later. Being a domestic animal is tough, people can let you down. See it from their side. When a herding dog gets separated from his herd, whether by accident or intention, it means they have failed the job they were born to do. That’s a horrible mistake for a dog with a Type A instinct. It’s enough to make you bark hysterically until you are so hysterical you can’t stop barking. Then more separation, and naturally, more barking. And finally, if getting moved around starts to be a habit, a dog could lose track of his own heart. What if he is barking to be found? Well, so what if he likes the sound of his own voice? My clients will tell you that I’m the exact same way. And we both hate vacuum cleaners… passionately. And yes, his relationship history is a bit checkered and mine… well, you know where I am headed with this. I’ve had dogs with better morals and personal habits than mine, and to tell the truth, it was like living with someone else’s spinster aunt. I’ll take a bad dog any day. Preacher has some things he needs to say. I listen, not that my hearing loss doesn’t come in handy sometimes. Reward the good and ignore the rest, and with some patience, his confidence will grow and so will the spaces between the barks. We talk about this in horse rescue as well, a lot of animals are just one bad behavior away from people giving up on them. If owners would patiently try again, maybe get some advice from a trainer, things could turn around pretty quickly. I know there are corgis in local rescues that need homes, and I’m not sure how I got involved with this interstate corgi trafficking thing, but I met Preacher Man at the airport. It was a silent, soulful ride home in the truck, sizing each other up. “Good Boy.” I said, all the way back. Walter and Preacher Man recognized each other immediately. They sleep like brothers under my desk, they share concerns about the barn chaos when I feed, and they use a team approach to keep me safe in the bathroom. It’s good to feel secure in your own home. I know what you are thinking: a grey-haired woman who rides horses and has a growing a pack of yodeling corgis underfoot. That’s right. I am becoming the Queen of England. Only different. Every Queen needs bodyguards and a preacher. “Like any dog still breathing isn’t my kind of dog”, laughing and giggling in solidarity! oh-oh-oh-oh this is too wonderful for words! But you found the words! Oh, well done, Anna! You make the world a better place for dogs and horses one animal at a time. You may not be THE queen, but you’re a queen nonetheless. We’ll see you on the course…. How adorable those two are! And how mischievous they look! I really like your theory on rescue animals. “Barking to be found” is such an engaging idea. I have two rescue Siberian huskies. They are complete handfuls, but exactly my kind of dog. I get them, and both of them immediately seemed to recognize that and relax. It’s gratifying to be able to give a lost animal a purpose, peace, and a place to call home. I love the north breeds, so beautiful. Good for you, and even better for them. You know I love it! Your kingdom is rich. Can you hear the call? Ruuu-beeee! Oh, Anna! I HOWLED with laughter at this one!!! You are on hell of a funny writer. By the way, should I bow before the Queen when I come for my lesson today? So are two corgis quieter than one? That’s corgi math. Maybe it’s harmony… but it isnt bad. Gets better every day. you crack me up! i just love your blog. keep on yodeling! My two favorite lines: interstate Corgi trafficking and that you’re becoming the Queen of England–sort of. LOL! I’m so glad the Corgis have you. Adorable. Thanks, Susan. 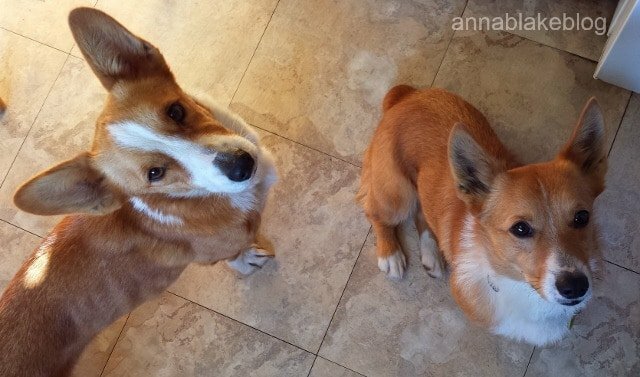 It’s hard to not think of the Queen when Corgis are around… Pomp and Circumstance… and corgis?? Thank you for all you do for rescue animals. Any animal who finds his/her way to your heart and home is very fortunate. It is a fair trade, I certainly get back more than I give. I think you feel the same with the animals you work with… but thank you for saying so on this MLK day. Love that Anna Blake… I’m catching up on your blogs… I have the sticker on my vehicles (and always will): the greatness of a nation and it’s moral progress can be judged by the way it’s animals are treated. Thanks, Jen. It’s a great quote, and I am really enjoying you and yours… thanks for the ride today. What nice horses you have. Love the blog, funny and true! I have 5 rescue dogs (including 2 border collies) and I recognize the barking problem.. but I, too, am very safe in the bathroom. And I share the grey-haired horse riding fetish .. thanks to Clairol #65 no-one will every know, and the horses won’t tell. That sounds like the horse is grey-haired, don’t I wish! I particularly enjoyed the “Walking the walk” blog. I agree with it completely and my back gets so well massaged in the process. Thank you for sharing! You are a GEM providing a respite for such wonderful Corgis as Walter and Preacher Man….your writing is wonderful and engaging and I especially like your references to Interstate Corgi Trafficking and the Corgi Witness Protection Program….keep up the good work and you will be greatly rewarded!